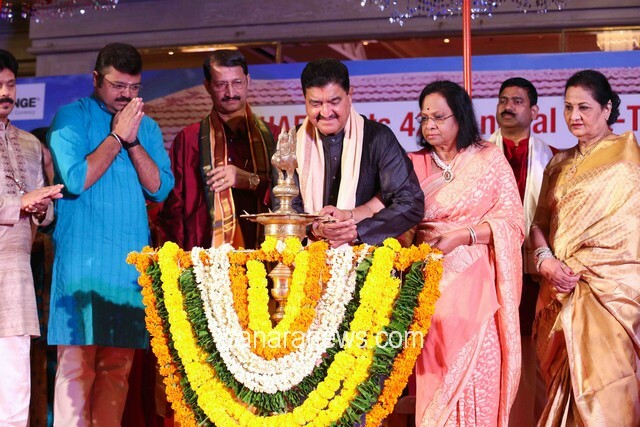 Dubai: UAE Bunts one of the vibrant community association of Bunts concluded their 42nd anniversary in UAE with a rich colourful cultural glory together with 'Bunta Vibhushana' presentation, 'Bunt Perfect Jodi 2016' & 'Folk/Cinematic Dance' Competition all in one perfectly built beautifully 'Guthu House' backdrop stage erected within the premises of Crowne Plaza, Jumeirah Ball Room yesterday the 15th April, 2016 witnessed by jam packed crowd of more than 1200 glued to their seats from 10 am in the morning until late evening applauding, cheering and enjoying the whole days entertainment programme throughout in style. 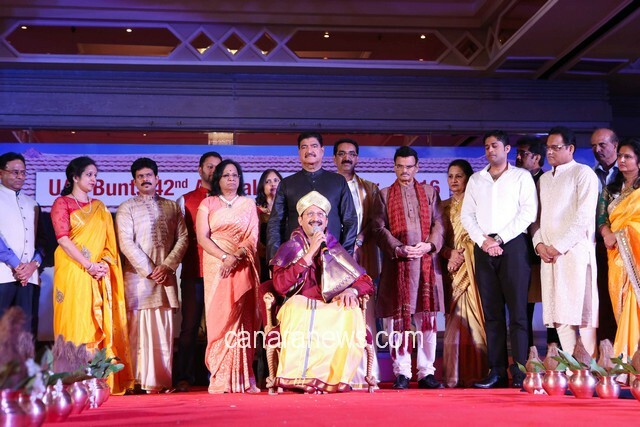 As scheduled the inauguration itself was a glittering ceremony consisting of dignitaries, colorfully dressed bunts ladies holding 'auspicious Purna-Kumb Kalasha' in hand & Committee Members all lined in a grand drum beat procession with the leading man himself a strong Convenor of UAE Bunts, Padmashree Dr. B.R. 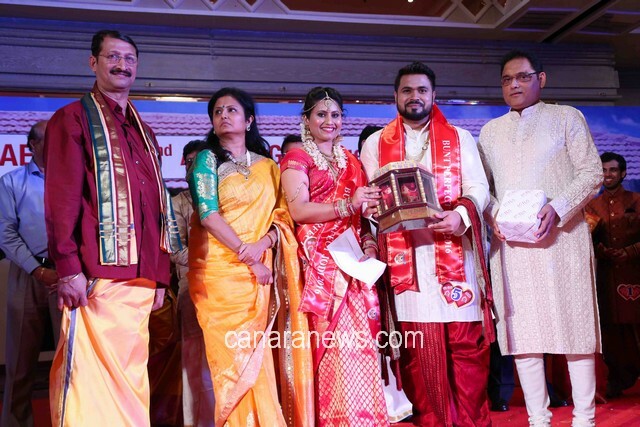 Shetty along with his wife Dr. Chandrakurmari B.R. Shetty and Son, Binoy R. Shetty leading the procession towards the well decorated main stage. 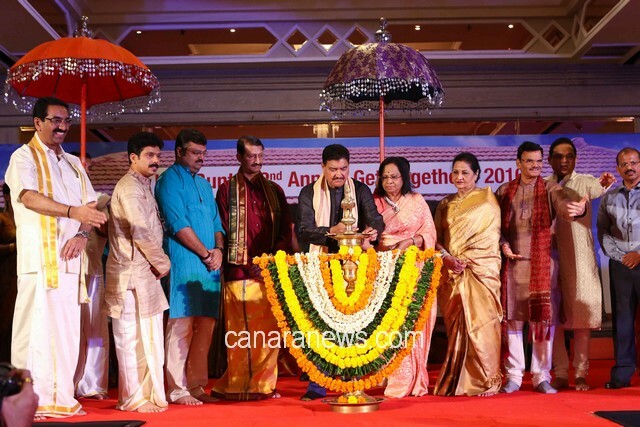 Soon the day long programme got a flag off with the traditional lighting of the lamp by all the dignitaries on stage. The strong man of UAE Bunts, President Sarvotham Shetty welcomed the Community Members & Guests traditionally and greeted them with good wishes on account Vishu-Ugadi New Year and Ramanavami auspicious celebrations which falls incidentally on the same day. Welcome song by Sangeetha Satish Shetty and Welcome Dance by Shannel Sharath Shetty both gave a strong vibrant start to the programme compered by Sarvotham & Jyothika Harsha Shetty. 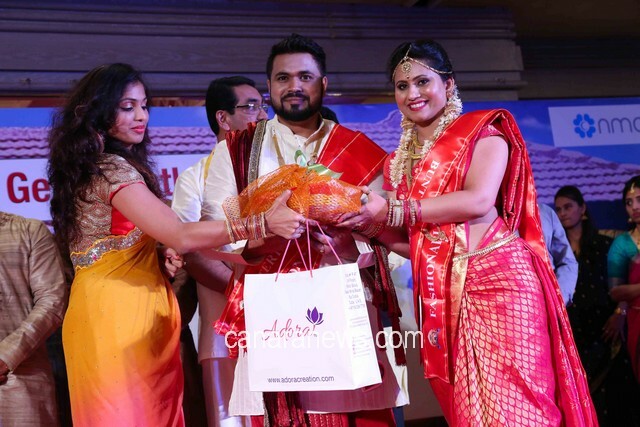 Sampath Shetty joined them to continue with the compeering and later presented various other dances throughout. 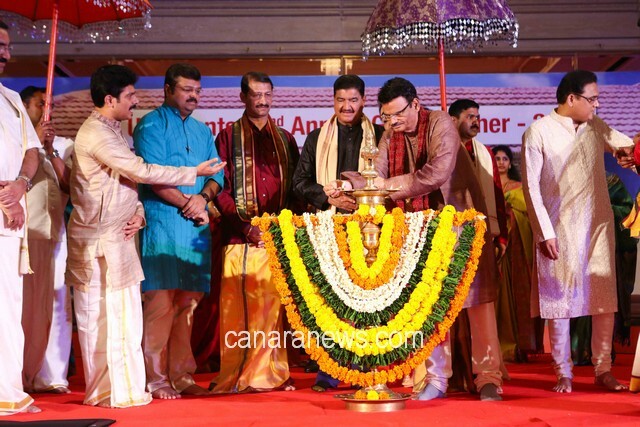 Followed was "Shiva Thandav" Nritya by Praveen Shetty & Team which was spell bound. Later on behalf of the Working Committee of 2016, Amitha Balakrishna Shetty rendered welcome speech briefing on the activities. Soon there was a beautiful Bollywood Fusion dance by Monisha Shartha Shetty & Team which received good applause by the audience followed by 'Thundering Kidzz' dance by Sudha Sudhir Shetty, Mussaffah, Abu Dhabi. 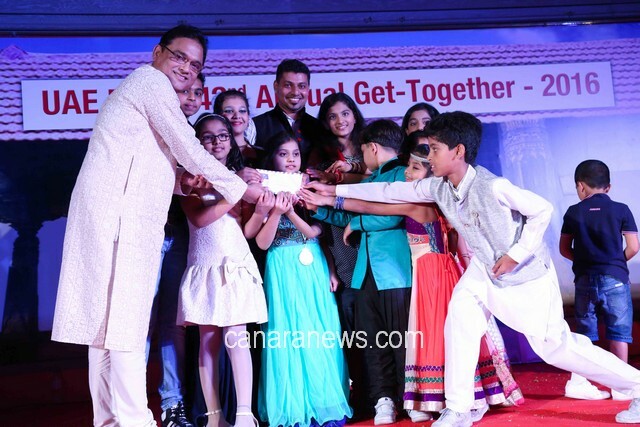 One of the popular powerful motivational orator Mithun Chakravarty Sulibele who was in town for some other Kannadiga programme was honourably invited to give a small talk. He was invited on to the stage and honoured. 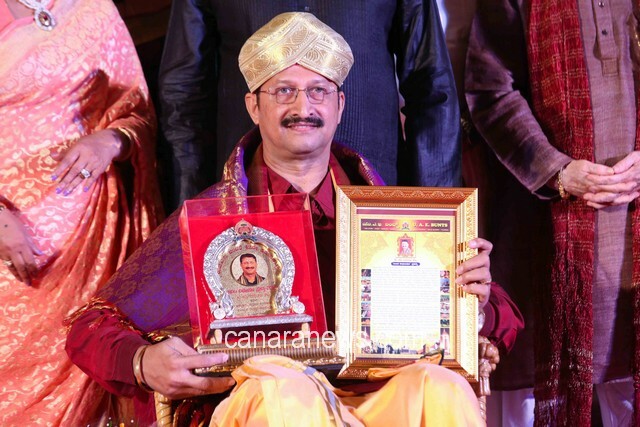 The Honnavara born Chakravarty, mentor of Yuva Brigade, a King of Talk himself took the audience into 'Mere Bharath Mahan' orating and motivating the richness of one of the greatest tolerant country in the world which provided and still stands tall as an example to rest to follow. Hearing the 'Bharath Darshan' motivational speech the audience were spell bound and got enriched with the honour of the great country they always loved being born in. The present working committee members comprising of Prasanna Shetty, Chitra Prasanna Shetty, Vivek Shetty, Vijetha Shetty, Nagaraj Shetty, Deepthi Nagaraj Shetty, Diwaker Shetty, Suprtitha Shetty, Subrath Shetty, Nagaraj Shetty, Sudhir Shetty, Sudha Sudhir Shetty, Guruprasad Bhandary, Shakeela Bhandary, Sudhir Hegde, Anisha Sudhir Hegde, Balkrishna Shetty, Amitha Balkrishna Shetty, Nagaraj Shetty & Rajani Nagaraj Shetty are those who have worked throughout the year for the success of this 42nd UAE Bunts Annual Programme jointly. They welcomed the new committee for the year 2016-17 who were invited on to the stage and were introduced to the audience who were wished for the future success. Sarvotham Shetty while thanking the current committee also welcomed and wished the new committee all success for the year to come. 'Bollywood Rockers' by Jogi/Veena Satish Shetty, Dubai, 'Malenadina Aata Tulunadina Kundiata' by Rajani/Dilip of Al Ain, 'Khatak' by Spriya Kiran Rai/Asha Jayaram Rai, Abu Dhabi provided different taste of variety dance forms to the hungry audience who applauded them unstopping throughout their performance. 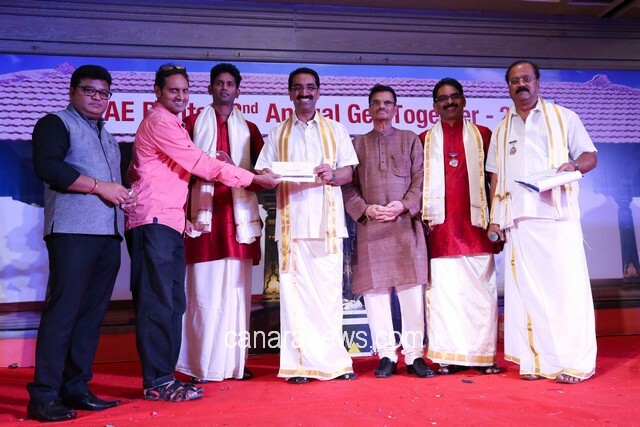 UAE Bunts this year chose Kadri Navneeth Shetty for his true contribution towards Tulu language, Folk, Culture, Sport, Community, Literature and recognized him for the "Bunta Vibhusana' honour this year. 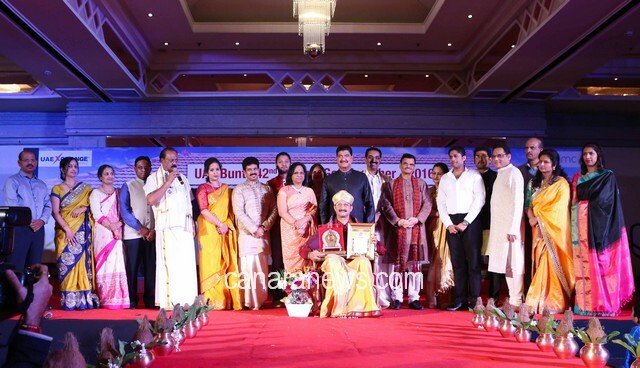 He was invited on to the stage and felicitated with honours, Title, Mysore Peta, Flower Bouquet, Shawl and Fruit basket by Dr. B.R. 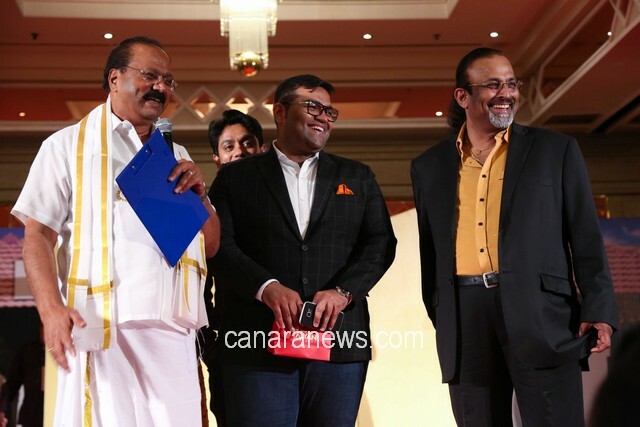 Shetty, Sarvotham Shetty while Ganesh Rai read out the felicitation certificate. On response to the honours he said ‘Tulu has gained universal recognition now. 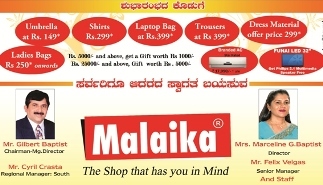 The Tulu desi culture has inculcated certain humane values among the people. It being an agriculture society the work culture of this land has taught us to respect food and agricultural land. The joint family system here besides bringing about tolerance and dedication has taught people to respect elders. Concluding he requested all his community members to please support our own people who still are continuing and preserving agriculture back home with whatever finance help they can, so that our tradition and values remain forever and continue to flourish throughout in the future. Those topper students of the community who excelled in their academic, sports were identified and honoured on the stage. Bunts Ladies Throw Ball Team winners & Men's Throw Ball Winning Team were also invited on to the stage and honoured. 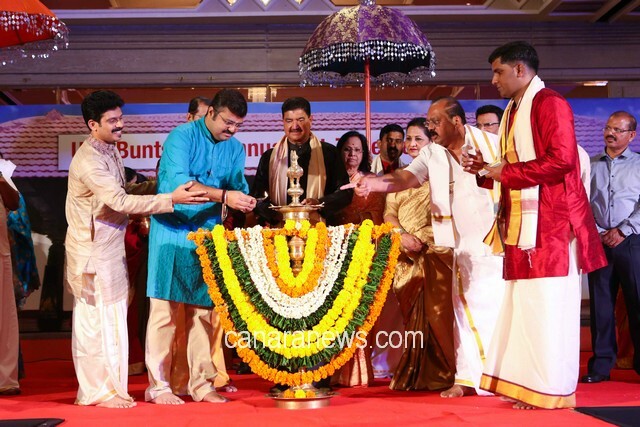 Bunts Shree Satyanarayana Pooja Samithi Working Committee comprising of Raviraj Shetty, Sashi Shetty along with Bunts Blood Donation Campaign co-coordinators Uday Shetty, Sashi Shetty couple and Sports Committee Chief Kiran Shetty were all recognized for their hard work and felicitated on the stage for their good deeds. 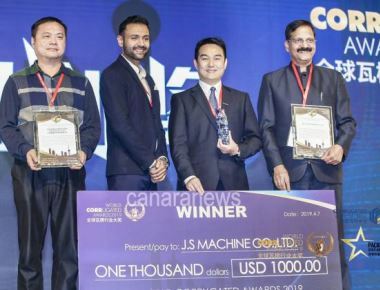 All Sponsors & Media Representatives were invited on to the stage and honoured at the same time for all their support for an successful event to happen. 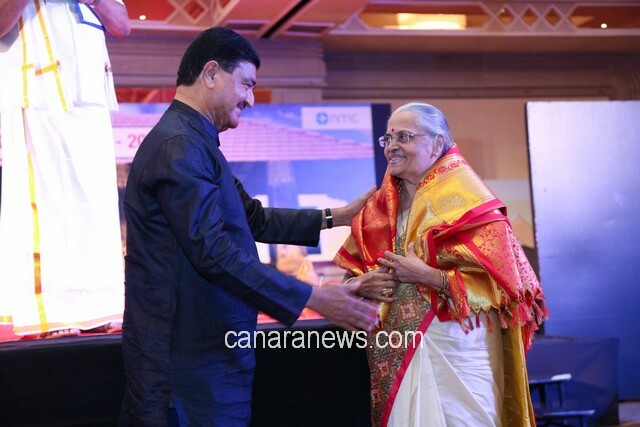 In between an elderly lady Mrs. Shetty who was the recipient of the first female doctorate in Bunts Community and who came all the way from Hyderabad was honoured by Dr. B.R. Shetty. In between was sumptuous long spread vegetarian non vegetarian variety buffet open spread enjoyed and savoured by all the audience who grabbed and came back to their seats not to miss the ongoing activities on stage. One cannot miss the variety desert spread of Gajar Halva, Gulab Jamun, Variety Tarts, Cakes, Pudding etc., which kept the tongue tingling for more and more. 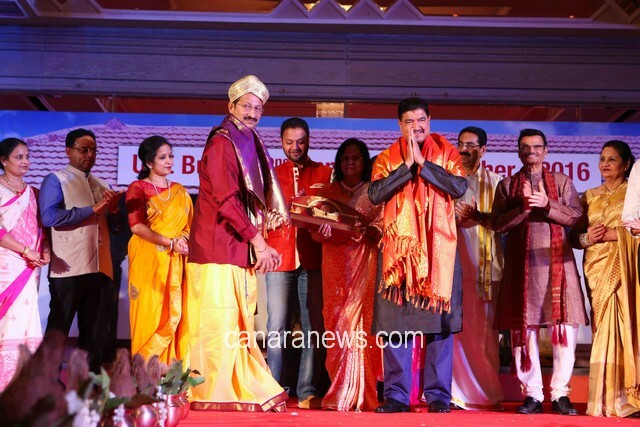 And to add spice was melodious songs rendered by Kiran Shetty & Group with various memorable numbers. 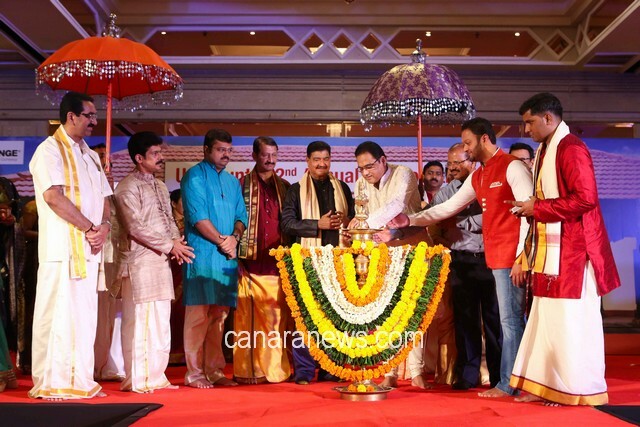 Soon was a Tulu Skit 'Udayanna Hotel' by Ganesh Shetty and Team which took the audience into relaxed moment while 'Show Dance' by Dhrithi Venkatesh and Vijay Jogi got good applaud. At the same time all the choreographers and directors of the different stage programmes were invited on to the stage and honoured. There were different teams comprising of 'Sangolli Rayanna', 'Kithoor Chennamma', 'Rani Abakka', 'Onake Obavva' & 'Mayura Varma' names who really gave unexpected nail biting performances one after another logically colourful and meaningful leaving tough decission to the judges to decide seeing the continuous applauses from the audience one after another respectfully. 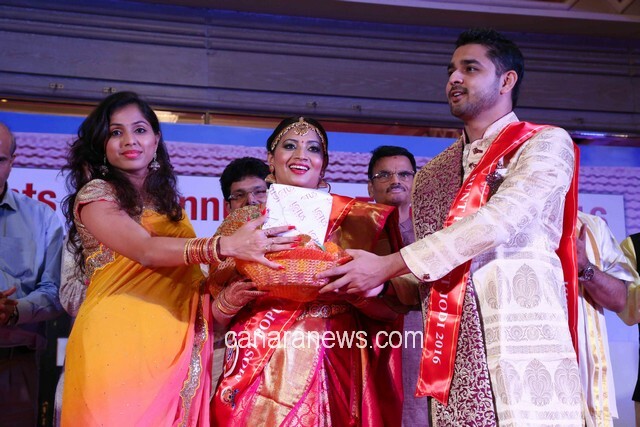 This year the special attraction was 'Bunts Perfect Jodi' competition for those Bunts couple who are enjoying less than 10 years of their marriage anniversary. There were many competitions who enthusiastically came forward to participate sportingly and were cut down to 9 couples as finalists during the first round of the competition held much before the event. These 9 finalists had to perform two more rounds on the stage in front of the audience and three judges to finish off with the final results. 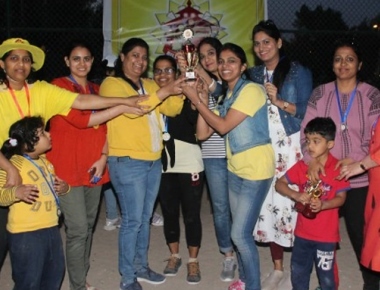 Their sporting performances throughout the rounds took the audience into total entertainment and one could see the supports they received from every corner of the audience with applauds, whistles and gestures. 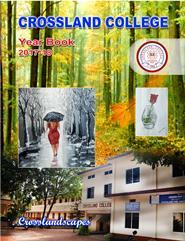 The first and second round were ably managed by Deepthi Salian, Chitra & Manoj. 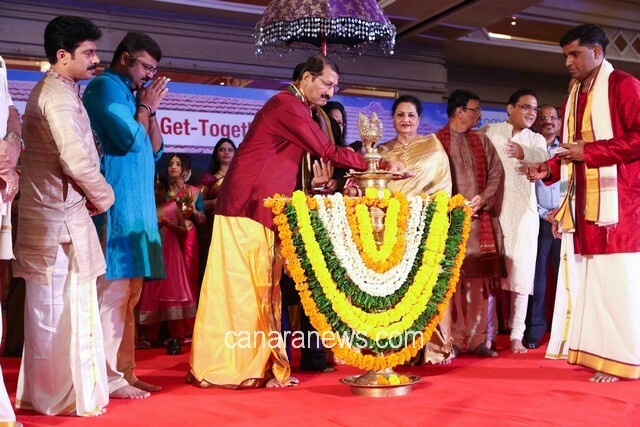 Kadri Navneeth Shetty ably compeered the total event in his own imitable style in Tulu giving light moments to the couples to maintain freshness on their face. Some of the performances gave unexpected gestures and answers really enjoyed by the audience and supporters of the couples whose sound of applauses could be heard from every corner. The able judges comprising of Kavita, Jyothi & Shakeel had to face really tough time to finalise the winners but however they finally came out with their unanimous right decision to announce the results. The Winners were pronouced and honoured with the titles and appreciations while the judges were also invited on to the stage and honoured. 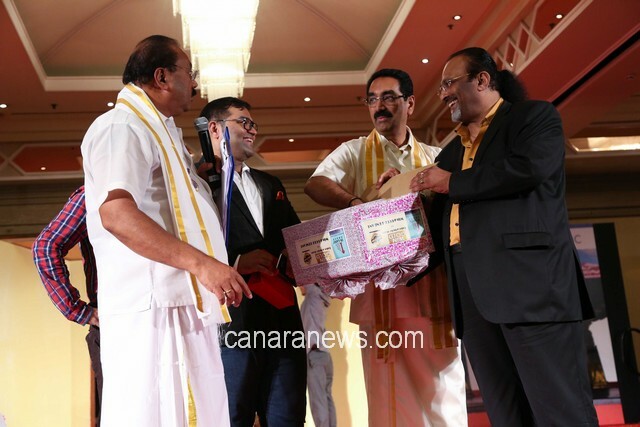 Concluding were Bunts Lucky Draw competition along with other special lucky draws by some of the sponsors of the event with gold pendant by Inland Group Builders and Malabar Gold with gold ornament which took place on the stage and winners announced on the spot and prizes distributed instantly. 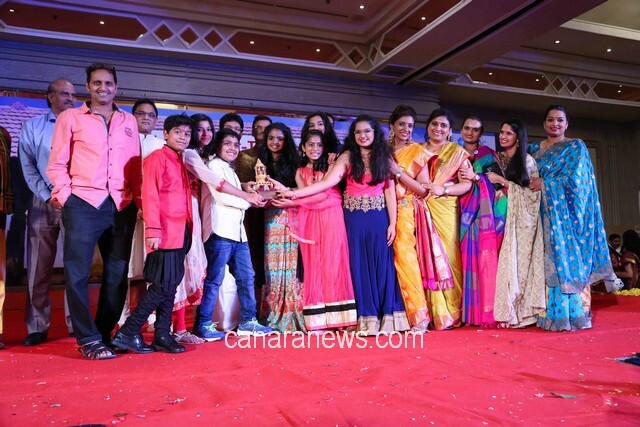 Sarvotham Shetty managed this event smoothly in his own style. 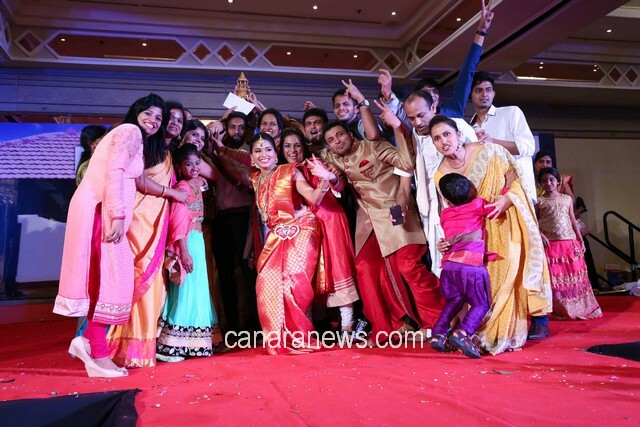 Sampath Shetty & Jyothika Shetty along with Sarvotham Shetty ably compeered most of the entertainment programme throughout the day tirelessly.